The building housing GSW's administrative headquarters is one of the best examples of architectural development in Berlin so far. The slab on the main facade slopes slightly backward so that it has a concave shape which offers ample space for access to the new GSW offices; the western side of the building is different, with a stepped wooden terrace offering truly unique views out over the city of Berlin. 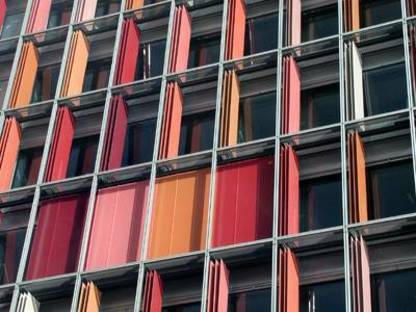 The building's glass facade is a radiant mosaic of reddish orange sunshade panels on the western side, but is completely different to the east, where it is silvery white in colour. The entrance, which can barely be made out from the street, opens into an elegant three-level atrium surrounded by galleries; this is followed by a foyer providing access to the upper storeys of the glass tower. The reduced depth of the tower (11.5 metres) accentuates its slender appearance so that it appears as if suspended over the void; in contrast with the tower, the base emits a sense of earthly gravity, as it is covered in slabs of slate-grey ceramic. The GSW headquarters are an emblematic example of sustainable architecture employing energy-conserving construction techniques. An ingenious integrated closure system permits natural ventilation, helping air flow through the building from the east to the west; air circulates freely within dividing walls, without causing any kind of disturbance and preventing transmission of sound. Natural thermal currents are intensified by an aerodynamic cantilevered roof covering the entire length of the building and generating a strong depression.